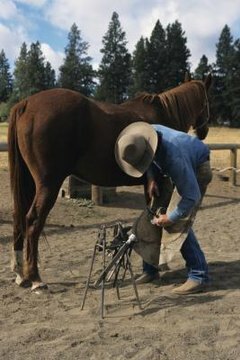 Horse shoes usually remain on the animal's hooves until the farrier returns, but horses occasionally throw shoes out in the paddock or during a ride. Sometimes part of the hoof wall comes off with the shoe, which can cause pain, and it is important to check the hooves of shod horses after every ride to detect this problem. Examine your horse's hoof as soon as you realize he has thrown a shoe. Look for missing chunks of the hoof wall as well as nails still embedded in the hoof. Sometimes a horse will only partially throw a shoe. If this is the case, it is important to remove the shoe completely before moving the horse. Riders and stable owners sometimes keep farrier tools on hand. Learning how to use pincers, nippers and rasps will make it easier to tend to your horse when the farrier is unavailable. Contact your farrier or veterinarian when your horse throws a shoe. A professional should evaluate the hoof and fit your horse for a new shoe as soon as possible. A missing shoe makes your horse feel off-balance and can cause him to pull a muscle. If your farrier or veterinarian cannot respond immediately, consider fitting your horse with a hoof boot to protect the hoof in the meantime. Your veterinarian might also recommend packing the hoof boot with cotton to prevent bruising and abscesses or wrapping the hoof with duct tape to protect it until professional treatment can be rendered. You might not notice a lost horseshoe right away, in which case your horse might be ridden partially barefoot for an extended period of time. The shoe protects your horse's hoof from uneven terrain, stones, gravel and other irritants, and its loss might cause sole bruising, especially if your horse has always been shod. A horse that has suffered a sole bruise will usually exhibit symptoms of lameness and his heels might be warm to the touch. Call your veterinarian if you suspect a sole bruise and put your horse on immediate rest. Your vet might recommend a poultice for a short period of time. Some horses live their entire lives barefoot, never wearing shoes. This does not mean you can ride your horse while he is missing a shoe, however, because the loss of height in one hoof will leave his legs uneven. This is especially true if your horse suffers from a thin sole. Some riders remove the other shoes after one is thrown, but this should only be attempted by experienced professionals who know how to properly remove shoes. Even then, it is unwise to ride a normally shod horse barefoot without the advice of a qualified farrier or veterinarian. Approximately 80 percent of lost shoes occur on the front hooves, but this situation is rare among most horses. A lost shoe is often caused by muddy terrain, overreaching by the hind hooves or poor farrier work. If your horse loses shoes on a regular basis, have him evaluated by a veterinarian. You might consider hiring a new farrier or having the shoes replaced more frequently.